If your wood is not properly seasoned then it will be hard to light your fire, once going it will not give off good heat (lots of the heat will be used to evaporate the water contained in the wood), and it will produce a lot of deposits in your stove, flue and chimney. These deposits can not only reduce the life of your stove, flue and chimney, but also greatly increase your risk of having a chimney fire. This is especially important in a wood boiler stove as the firebox is that much colder than in a non-boiler stove. A good sign that logs are well seasoned is that the end grain will have quite a few cracks - these cracks are a result of the wood shrinking as it has dried. Well seasoned wood should have a moisture content of 20% or lower. You can buy a wood moisture content meter - these normally have two pins that you push into the wood and the meter then measures the electrical conductivity (the higher the conductivity the higher the water content) between the two pins and shows you a moisture content figure as a percentage on a screen. Make sure that you split a log and measure the moisture content off one of the split surfaces as the exposed surface of the wood will of course give a lower reading than wood from inside the log. If you harvest your own firewood then preparing and seasoning the logs is a very important consideration. Fell trees in winter when the sap has fallen and the wood therefore has a lower water content anyway. Cut the tree into rounds of the correct height for your stove and then split with a maul straight away into the desired size of logs. Chopped logs dry faster than rounds of wood plus the wood is much easier to split when freshly cut and wet. Store the wood in a well ventilated dry place - you may use a log shed or you may assemble covered stacks. Either way the wood should be stored like this for at least a whole season - ie from the winter when they are felled to the start of the heating season in late autumn. Ideally the wood should be stored for two seasons - it will certainly burn better, but in practice many people are not that organised! If you are making a quick DIY log shed then I have found that old pallets make good walls for logs sheds that still let air through. 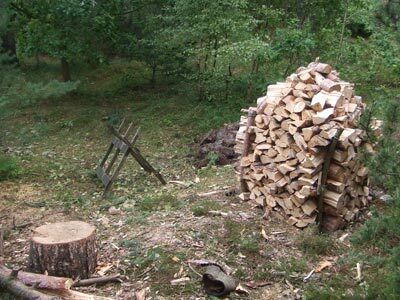 The Stovesonline firewood supplier search system can help you easily locate a firewood supplier.